Up until a few years ago, I relied on my fingertips to apply my makeup. Almost neanderthal-like, I know but, like it does for many other daily tasks, my digits saw me through those wonderful years when I was exploring beauty. That was until makeup brushes came into my life and changed it completely. I could liken my brush set to a young baby - soft, fantastic to look at but require a whole lot of attention. While they changed the way I applied makeup drastically and gave me the flawless finish I've craved for, I soon realized that the brushes couldn't be expected to only give, give, give. Like attention-seeking babies, they need care and attention in the form of a cleanse. When it is just the extra product that needs to be removed, it is adequate to dust the brush on a tissue or use a brush scrubber. But if you're more invested in your brushes, you would know that every once in a while, they deserve a deep clean. Specifically being a tool that comes in contact with your skin, brushes should be hygienic and give you the application you want. A deep clean is therefore necessary to remove the excess gunk and skin cells that accumulate under the bristles, leaving your brushes clean to use on your skin. 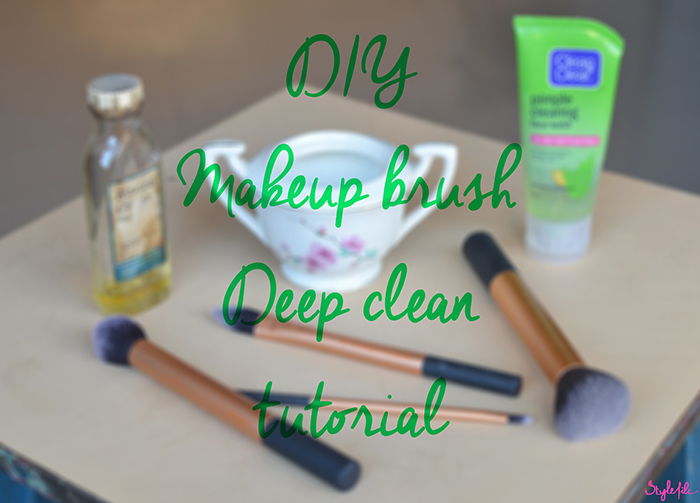 Here's a step-by-step guide give your brushes a deep clean. You will need a jar of medium height and the makeup brushes in question. 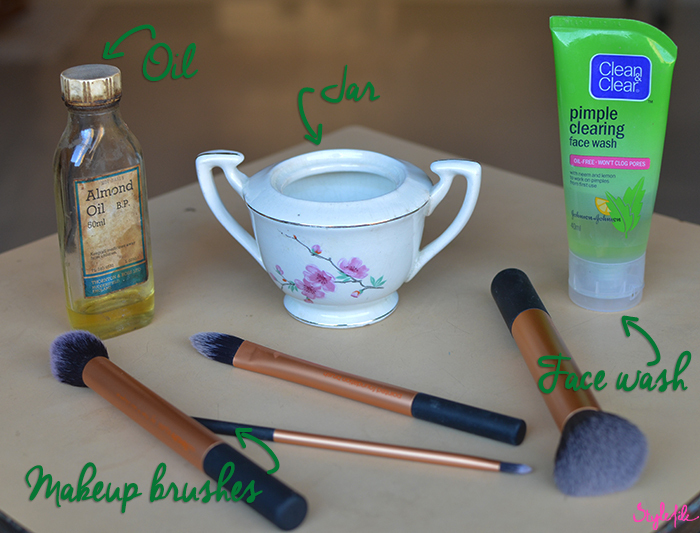 Along with that, an oil to get in there and break down the makeup which an ordinary cleanser cannot do. I recommend a pure almond or coconut oil. Lastly, a trusted face wash that you have used on your skin. I use the Clean & Clear Pimple Clearing Face Wash, which I recommend as well since it does a thorough job of cleaning any excess oil and makeup gunk. Fill the jar with water to a height where the tips of the bristles are immersed in it but the base where it is attached to the handle isn't. This is a precautionary step to ensure that the soaking process doesn't loosen the glue of the brush. Next, add a few drops of oil to the water and a good squeeze of the face wash. 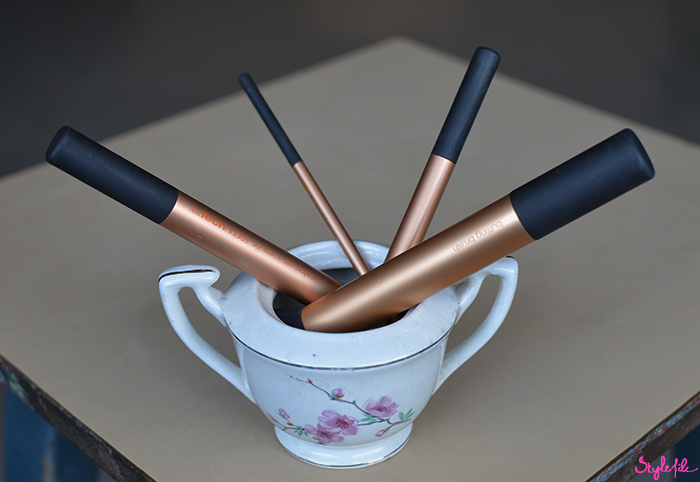 Mix it together thoroughly and immerse your brushes in the water. Leave them to soak in a shady corner of your house for 30 - 40 minutes. Step #3 - It's deep cleanse time! Remove the brush from the soaking solution and hold it under a running stream of tap water for a few seconds. Then turn off the tap and taking a pea size quantity of the face wash, apply it over the bristles of the brush. Go back and forth over the back of your hand with the brush to allow the face wash to reach deep within the bristles. You might begin to find smears and smudges of concealer, eye shadow and foundation emerging from within the brush. That's a good thing because the deep cleanse is supposed to do just that for the brushes. Carry on brushing it back and forth for a few minutes or until you have noticed most of the makeup residue come out. With a pinching motion, gently take your fingers from base to tip of the brush and remove all the residue. Then go back to holding your brush under running water for a minute or two, until the water from it is clear. If you still find any makeup or oiliness on your brush bristles, go back to brushing it with face wash and washing it off until it is clean. With the cleansing of your brushing almost complete, place the wet brushes on a newspaper or a clean towel lying flat horizontally so that they dry while retaining their original shape. Tuck them away in a shady nook for a good 5 - 6 hours. 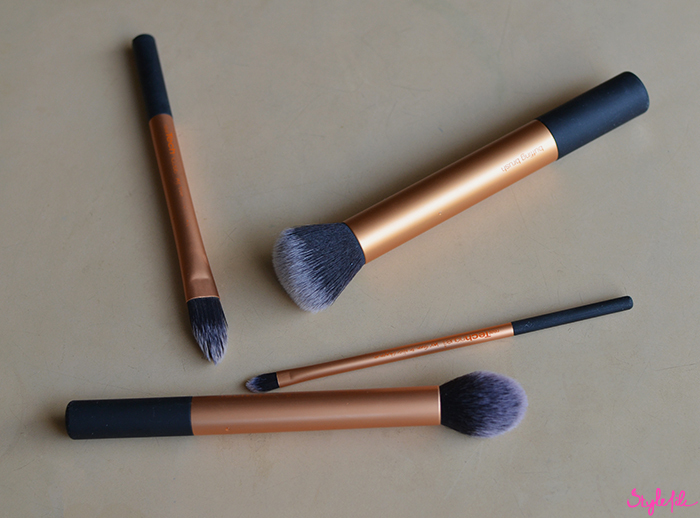 Once dried and clean, your makeup brushes will be all geared up for your next occasion.